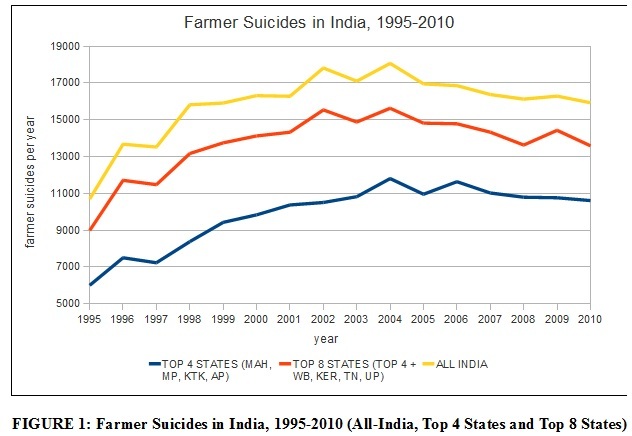 A new report has been released addressing the epidemic of Farmer Suicides in India. Since 1995, more than 253,000 farmers have been reported to have committed suicides in India, making this the largest wave of suicides in the world. Other than a few conscientious journalists like P. Sainath and Jaideep Hardikar, the mainstream media has largely ignored this historically unprecedented event. Busy with crafting a palatable picture of “shining” India, the mainstream media has neglected its duty to report on the lives and livelihoods of the largest group of working people in India: farmers. The Indian government’s actions on this issue has been equally, if not more, deplorable. Other than making vapid pronouncements and organizing high-publicity visits of Prime and Chief Ministers to the region, the Central and State governments have done little to ameliorate the conditions of the miserable farmers. No wonder then that the abominable phenomenon of farmer suicides continues with unmitigated ferocity. As a reminder that business-as-usual means disaster for the aam aadmi in Shining India, it was recently reported in the press that a fresh wave of suicides have occurred in various states in India in 2011. Read the rest of the report by The Sanhati Collective here.